This is a guest contribution from someone who got in touch with us at HealthTransformation who has vaped for a number of years, and credits it with dramatically improving their life, and they wish to remain anonymous. They mentioned to us how, in the public eye, vaping is shed in negative light a lot of the time, and that, how it was pointed out in this article on Vice, that most studies are looking into the negative side effects of vaping, as opposed to the benefits. They also wanted us to be sure to add this here, because the industry is under a lot of scrutiny, and that words need to be chosen carefully for numerous reasons – Todd. I am not a doctor, and this information is my personal opinion and experience. Vaping devices are not FDA approved for weight loss, quitting smoking, or health benefits. Consult your doctor at once if you do have health issues that need addressing. OK, with that out of the way, yes vaping has helped me personally in all the areas I am about to mention. I personally think it is a boon to the world, and I know plenty of people agree with that sentiment. Who Are They Who Don’t Want Us To Know? Our voices get squelched by big interests, since there are many billions of dollars moving through the vapor product industry at present, and there are many ideas running around in media outlets. Not all bad, but a negative light does get associated with vaping, more often than positive aspects, and so I am adding to the positive side of this, and hopefully this will be helpful information for some people like me. I’m not much of a conspiracy theorist, but when I compare what I know through my experience vaping, and compare to what seems to be the public perception via media headlines etc., that is part of what made me want to write this and reach out to a website to see if they would let me publish it. That all being said, this has been my experience. How Can Vaping Help You Lose Weight? Cut back on sweets – this is one thing i love about vaping, as I have become more health conscious since I switched from smoking, and have been watching my calories. I will often have a nice sweet vape after a meal, with a sweet sugar-free coffee, and this hits my dessert spot beautifully! Improved cardio – as a result of vaping, my breathing has improved, and I am less out of breath going up stairs, and I notice a difference when doing cardio. Not only is this obviously a good thing health-wise, but also, when I am able to run farther, etc., obviously I burn more calories, bringing me closer to my weight loss goals. (So far I have lost a little more than 20 pounds, over the course of just over 6 months, and am getting closer to my goal). More exhalation – this is a less studied area, but experts say about 80% of fat leaves the body through exhaling, how crazy is that? And many vapers enjoy nice long, deep inhales and exhales, and so you can keep this in mind as you breathe out that vapor. This is obviously a more abstract point, but certainly something to take note of! 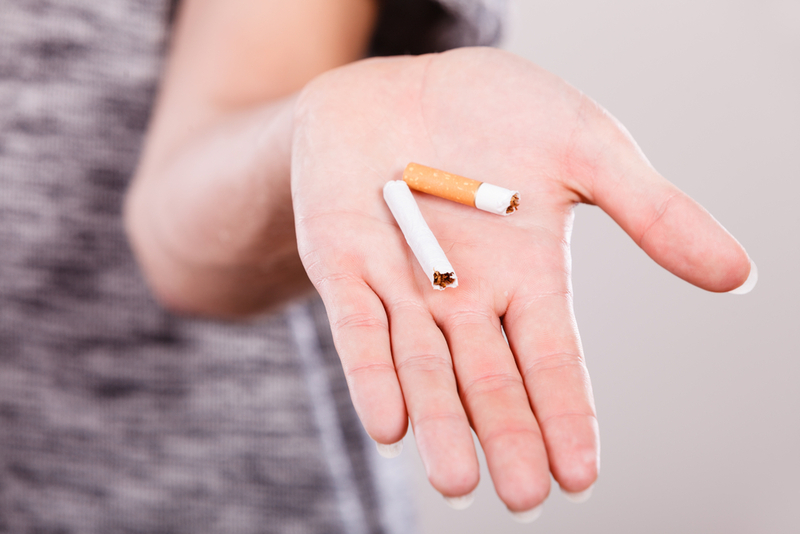 Tobacco smoking mitigates weight gain through nicotine’s effect on the brain and metabolism. Nicotine is known to be an appetite suppressant. I have hung out in vape shops, and this is basically yesterday’s news, as far as it goes for many people who I’ve met in them. Day after day, people come in, excited about how they now use vapor products, and don’t smoke anymore. They are excited to spend some of the money they have saved by vaping on the new flavors or devices available. I personally know numerous people who have made the switch to vaping, from tobacco cigarettes. Technically, in the vape industry, this is referred to as ‘switching to vaping’, as opposed to ‘quitting smoking’, for legal and regulatory reasons. For vape companies to actually call vapor products a quit smoking device can literally put their business in jeopardy, as anything that is termed a smoking cessation product, must be FDA approved. This is why you may not find many companies coming out and saying this directly. Electronic cigarettes and vapor products are not FDA approved smoking cessation devices. This is part of the reason I left the note up top. I personally have switched to vaping, and know many other people that have, and there are more and more studies coming out confirming the same. At the same time, I am doing my best to be respectful of the general sentiment of the vaping industry, by explaining this aspect, hopefully in a way that preserves the smoking cessation factor that these are not FDA approved, and so, use your own research into this. I suggest going to a vape shop or two and hanging out and meeting people! This is one of my favorite aspects about electronic cigarettes, you can save quite a bit of money over smoking tobacco cigarettes. Where I live, cigarettes cost a little bit over $10 per pack, and for me, I smoked at least 10 packs a week, which is around $100 per week. Now I go through a 60ml bottle of vape liquid per week, and I spend $25 on that. You do also have to buy a vaping device, a battery and charger. *Once I have purchased the device, charger, tank (which comes with 2 coils) and batteries ($135 total). You can do this for even less money also, by using a smaller device than I have, which will go through less of the liquid. You could spend as low as $30-$50 per month on the liquid, depending on that. This is one of those heart warming aspects. Literally EVERYONE I meet is so happy that their husband, wife, sister, brother or even father or mother has switched to vaping. Even though there are not many scientifically verified health benefits to vaping, since they need years to study the long term effects to enter something as scientifically verified, the overwhelming majority of people I’ve spoken with prefers their family member to vape as opposed to smoking, and feels that it is a healthier alternative. One reason I hear all the time is the smell is gone. Nobody likes the smell of cigarette smoke, especially someone who doesn’t smoke and shares the same bed with a smoker. Then each individual typically has their own positive experiences, between breathing better, feeling better, enjoying saving money, improved taste buds and sense off smell, and many also come to really love the camaraderie and community within the vaping world, and may even decide to get into the business itself since it has positively impacted their lives. In the business respect, it has also allowed thousands of people to gain employment through vaping businesses. I love this aspect, especially because I was overweight, and am getting closer and closer to the ideal weight for my height and age. Clearly that alone is a health benefit, that I personally credit a lot to vaping. I also found, that since I felt good vaping instead of smoking, I was motivated to get into better shape. I have met so many people who say they breathe better, feel better, etc., and you can even find some dramatic things, such as chest x-rays before and after vaping etc. I find that taking up vaping and living healthier becomes synonymous for many people, especially the contagious aspect of meeting other people on a similar path; and vaping seems to really cultivate that aspect. Once again, scientific evidence has yet to determine this all as fact, and electronic cigarettes are in no way FDA approved for anything health related, but this is once again, my personal experience, and just take a look at the aforementioned list of vaping benefits, and imagine if they were all true. Also, I will point out the quasi-obvious, you are clearly better off not vaping or smoking, and just breathing fresh air. No one denies that it would be better to just breathe air, and that there are some things in vapor; but here we are comparing to what is in smoke. There are studies being published on this, so more will be found out in the future; I am once again going by my experience, and sharing my personal opinion. Thanks for reading my article, and thanks Todd and the staff at Health Transformation for publishing my article!